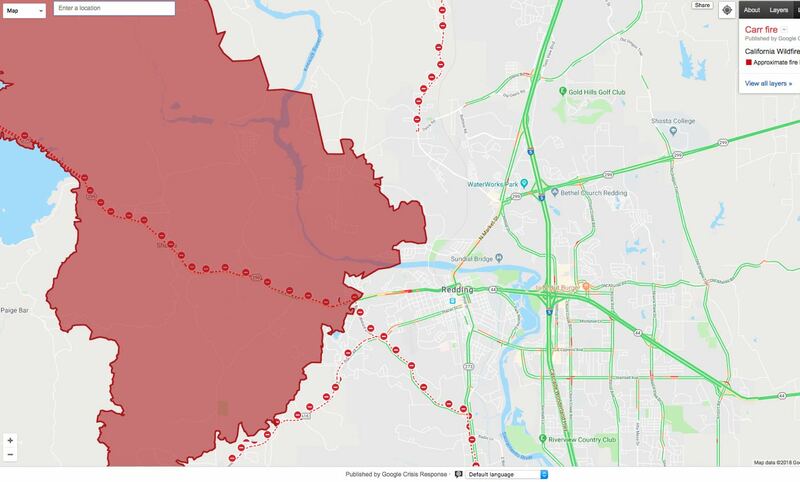 According to these maps, the church is just east of the east boundary of the fire, at a point due west of downtown Redding. The fire has been spreading in a southwesterly direction . . . I have cousins in Redding who have not lost their house but were evacuated Thursday morning. They say so far there is no containment and many of their friends have lost their homes. talked about two nineteenth-century landmarks up there having escaped the flames -- but nothing about Wright's northernmost California structure. The fire started out by Whiskeytown Lake on Monday. Someone pulling a travel trailer had a flat, didn’t realize it, kept driving on it until they were driving on the rim and the sparks started the Carr Fire. It was ten miles away, which we thought was a relatively safe distance, but Wednesday night I went outside to do something, looked up in the sky, and nearly had a heart attack. Towering above our house was a giant, boiling, dark brown, glowing fire cloud. It was so ominous I got a really bad feeling, so I went in and started packing for evacuation, around 9:00. We heard from neighbors that an evacuation might be forthcoming so we didn’t go to bed, checked in with two close friends to see if we could stay at their house. They were out of town but told us where the spare key was located. At about 2 AM we got a reverse 911 call telling us to evacuate, so we grabbed everything and loaded it into our car and truck. Ash was falling all around us. As we were leaving, along with a number of other neighbors, about twenty pieces of fire equipment were coming in. It was both heartening and frightening. As we were driving, huge clouds of smoke and ash were billowing in our headlights - it was like a snow storm. We drove to our friends’ house and got to bed about 2:30 AM. The smoke and ash were so thick there we didn’t have a good feeling about staying there and sure enough, when we woke up way too early the next morning, we heard that there was a hard closure on the main road we’d taken to get there. Other friends had offered a place to stay, and they were on the opposite side of town, the east side, so we packed up and headed over there, unpacked and figured we’d be staying there until we could go back home. I had a dental appointment at Hill Country Clinic, which is in the mountains to the east in Round Mountain, so we drove up there and I got my teeth cleaned and then we drove home. As we were coming down the flank of the mountain, we reached this place where you can see the entire north end of the Central Valley and we could see five separate fire clouds that looked like brown tornadoes. The news has said there are three heads to the fire, but we counted five. I didn’t get a picture of it, though I wish now I had, but we were mostly just horrified and shocked and weren’t thinking clearly at all. We decided to go have an early dinner out at a new restaurant on the river near Turtle Bay Museum and when we came out, we looked up and saw this crazy fire cloud that I did snap a picture of, one of the five columns. We then got a text from our friends saying the power was out at their house and it had been 113 that day, so we knew we couldn’t stay there but we would need to pick up the belongings we had left there. We headed to the road that would take us to their house and drove right into an insane traffic jam. 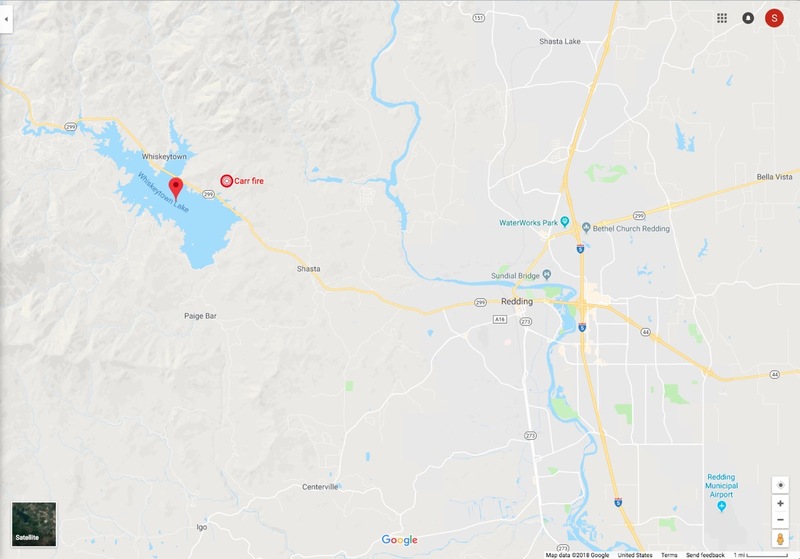 The fire had jumped the Sacramento River and fire tornadoes were ripping through the neighborhoods so people were frantically trying to get out, streaming out of the feeder roads that all led into the main road. It is a four-lane, two-way road but police had turned it into four lanes all going north to flee the fire and even then, we were only able to go about 3 mph. A drive that would normally take two or three minutes took an hour. We are so lucky that the fire wasn’t moving towards us any faster or honest to God, we would have burned up. There was no place to go! The fire was coming from our left and the river has a bend there to our right. We could only go with the traffic. We finally got to our friends’ house, and the power was indeed out and there was a soft evacuation in place for there so we took our flashlights and loaded up our stuff in the dark, in 100+ degrees. We were headed now to our third location, Richard’s former assistant’s house whose wife and three kids were away at camp. We thought we would take back roads to get there but everyone else had the same idea, plus the evacuation center that had been at the high school had just been moved to the college and this was one of the two ways to get there. So once again we were stuck in stop-and-go traffic. What would normally take ten minutes took an hour-and-a-half and my truck was starting to overheat. We were only a couple of miles away, but we had to pull over and stop and wait for the engine to cool off for a half-hour. We finally got to Nick’s at midnight and one of the other employees in the finance department at the clinic had had to evacuate from Shasta Lake City. Shasta Lake City is ten miles north of Redding. Nick had planned to go there to help Sharon evacuate, but he couldn’t get through the traffic so we just had to wait for her to show up. We got to bed around 1:00 AM. The next morning, we got a text from a good friend and neighbor telling us our entire neighborhood was gone, so we were trying to process that information. We checked with some other sources and got some information to indicate that, though their section of the neighborhood had all burned, the houses on the ridge, where we live, were spared. So that was a huge if temporary relief because with something like this, you can’t count on anything. And we were heartsick about our friends' home. We were trying to figure out where to go and what to do and decided that we should get out of all the vile smoke and anxiety and trauma that is now poor Redding and head for Oregon. We left the truck at Nick's and put everything in our Prius and drove up to Eugene to stay with my sister Lynda. She had her daughter Julie and her husband David and a friend from Japan staying with her but they kindly made room for us. We got our first good night’s sleep, thank God, though our lungs were really suffering from the smoke we’d inhaled over the previous two days and were coughing like crazy. Yesterday morning I was reading news about the fire and found that a new fire had started on our road. Then I found out that some friends' and neighbors’ home had burned. That preoccupied us all day until we got some information that indicated the fire had not moved in the direction of our home and that is probably still okay. We are now in Portland with Richard’s sister Kathleen and her husband Joe. We are exhausted, traumatized, filled with grief for our friends who have lost their homes, and devastated about what is happening to our small city. But we are beyond thankful for our beloved, kind, loving friends and family. That is the silver lining and one for which our gratitude is boundless." Compare to above maps. The fire initially spread east . . . The church's Facebook page indicates that while they had to cancel their Sunday services, the church appears safe and those in the immediate vicinity who had evacuated have been allowed to return. Thanks, Stan. It's good to know what's happened.